With a Vietnam veteran for a father and a World War II prisoner of war for a grandfather, Darrell Caron of Westbrook knows how the horrors of war can affect former soldiers. Caron, an Army Reserve captain, is now witnessing the direct effect of war on soldiers in Iraq, where he is a counselor to the men and women serving on the front line. Many don’t sleep well. They’re alert, hypersensitive to danger. They’re exhausted, yet they can’t relax. Some have seen or experienced things that give them nightmares. They’re restless, nervous, scared of being in a crowd. They may see faces in dreams. They may feel guilt or remorse because of those faces. The symptoms Caron is witnessing are not new to this war. However, the way the military is responding to those symptoms and the overall mental health of soldiers is different. Mental trauma is no longer a taboo subject. Caron’s position as a counselor speaks to that. He knows his father and grandfather didn’t have anyone like him to talk to. After the Vietnam War, the military began improving the way it responded to the mental health of soldiers, who now have the opportunity to meet with counselors during war. Many of them also receive mandatory counseling when they return from war after serving in combat. Caron has been posted in varying levels of safety in Iraq beginning nine months ago on a quiet border with Iran, in Baghdad, east of Baghdad, and now west of Baghdad. He said his latest position is remote and difficult. There are few amenities. He said he’s lucky, though, because he has his own computer and 24-hour access to the Internet. Most soldiers get about 30 minutes a day to e-mail friends and family. Caron said his first two months on the quiet border with Iran was pretty and almost peaceful. Since then, he’s been at what’s known as forward operating bases. Part of a company of about 100 soldiers who are nurses, psychologists, psychiatrists, occupational therapists and clinical social workers like Caron, he said probably only a half-dozen of those 100 have had combat experiences like he has. 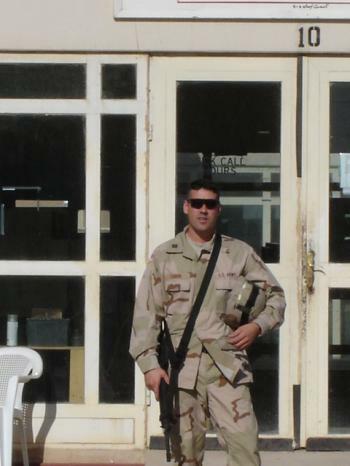 Much of his time is spent traveling around the Baghdad area providing counseling to soldiers. He also travels in convoys or flies in Black Hawk helicopters to extremely dangerous areas to give counseling to soldiers as close to the front line as possible. He said he’s even gone out on missions with soldiers to better understand what they’re going through. Caron works seven days a week, which he said is enough in itself to become fatigued and experience difficulties. “There are times when you feel like you’re going to hit a brick wall,” he said. But he said it’s better to work than be left idle to think about home. Caron said soldiers in Iraq experience some of the same experiences as people back home – births and deaths in families, graduations, illnesses. Only they’re missing them. Caron talks with them to deal with being there while life moves on without them at home. He also talks to them about problems that arise from being in Iraq. He said a fairly common scenario is one where a soldier is married and the communication breaks down in the marriage, leading to divorce. A soldier calls home to talk to a spouse and the spouse wants to talk about their troubles at home, but the soldier doesn’t want to talk about what they’re going through. The troubles at home seem trivial to the soldier. The spouse feels as though the soldier is closing them off, which they are. “Most soldiers who see things here never, ever want to talk about it, unless they’re with their soldier buddies,” Caron said. Calls become more difficult and less frequent. The spouse asks for a divorce. The soldier is left going through the divorce in Iraq, can’t go home and can’t do anything about it. “I think a large part of it is created by separation,” Caron said. Caron said two combat scenarios account for the majority of troubles he sees in soldiers. Roadside bombs cause quite a lot of stress, he said, because of their unexpected and traumatic nature. Caron said the event causes a lot of nightmares, restlessness, fear of crowds and fear of being in vehicles. Caron spoke of one Marine who had 40 percent of his face paralyzed because of a roadside bomb. He said the Marine had nightmares, was angry, couldn’t be in a crowd and jumped at the slightest noise. “It’s a very common response,” said Caron. Foot patrols are also nerve wracking because the soldier is totally exposed. If they engage an enemy, they may actually see the person’s face. Caron said they tend to see the person again in dreams and feel guilt, remorse and even anger after taking the person’s life. The general alertness and hypersensitivity to danger is also a common cause of troubles in soldiers, according to Caron. “It mentally and physically puts them to a point of exhaustion where it’s hard for them to relax, hard for them to sleep,” he said. He said some of the worst cases he sees are soldiers who have done multiple stints in-country. He said many of them think it’ll be different when they come back a second time, but all the old problems spring up again. Caron said he knows he’s experiencing some of these symptoms himself and will have to address them. Until recently he was teamed with another counselor, but his partner finished his tour and is now back at home in the United States. Caron said the two used to talk to each other to work through their problems. “We really rely on each other in this profession to keep each other going,” he said, adding that they have to mask their own problem to be able to deal with the problems of others. He said it’s harder now, and he’ll most likely have to make it through the last three months of his year there on his own. But he thinks the life experiences he brings with him can help him. Caron was married before, but he and his wife lost their son, Devon, three weeks after his first birthday from spinal muscular atrophy. They never recovered together and were divorced two years after his death. Caron said he was unable to get past the loss of his son and didn’t really grieve for him until four years after his death. He said he really began to grieve when he came to Iraq and had time to think on the quiet border with Iran. He feels his life experiences separate him a little bit from the younger soldiers who haven’t dealt with life trauma yet. Caron is 35, while many of the soldiers he counsels are in their 20s, he said. He feels his experience is different from his father’s in Vietnam, as well. Caron’s father, David, was 18 years old, a few days out of high school, when he joined the Army in June 1966. Just over a year later, he found himself in Vietnam. The experience was different in many ways from his son’s. Caron’s father said today most soldiers go to war with their own company, but when he went to Vietnam he was literally by himself. He said he received no reception. He got off the plane, stayed in barracks with a couple hundred other soldiers for two weeks, and then was sent off to a company. “You felt alone in a crowd,” he said. David Caron said the other guys in his company didn’t make an attempt to get to know him. He said the idea was they wouldn’t want to get to know him because he might not be there tomorrow. “They actually kind of shunned you off,” he said. He said he just figured that’s how it was, and eventually he got used to it. He spent his time counting the days until his year was up and he could come home. He said they hiked all day long, slept under a poncho at night and dealt with the heat and insects of the jungle. His company patrolled in different parts of the country, clashing with the North Vietnamese army and sometimes the Vietcong. He didn’t want to talk about anything he experienced during those clashes. All he would say was before a battle, his company might be 80 or 90 men, and afterwards just 70 or so. He said he didn’t have anyone to talk to. He said there was a chaplain for his company and others, but he saw him only about twice in the year he was there. He said he could write home by letter, but they usually got mail only every couple of weeks. After David Caron got home from Vietnam, he said the Army just dropped them off and said, “Thank you for your service. See ya.” He went back to regular duty after a month off, and he didn’t talk to anybody. He said there might have been a psychologist to talk to, but nobody did that. During that month off, he married Darrell Caron’s mother, Ellen Caron, who said it was hard to get to know him again after the war. She said he was still jumpy, angry and verbally abusive. “He was different. It took a long time for him to adjust,” she said. It’s a striking difference between son and father. And the same comparison can be made to Darrell Caron and his grandfather, Albert Caron, who served in World War II. Albert Caron wouldn’t talk about his experiences, but he has told his story to his family and gave them permission to talk about it. They said he was on an island in the Pacific when he was taken prisoner by the Japanese. He spent 18 months in a prison camp with hundreds of other prisoners. On July 4, 1943, he somehow managed to escape by himself and went up to the mountains and joined the Philippine guerillas. The Carons said when he eventually got off the island he was picked up by a submarine. Darrell Caron said he knows his grandfather has struggled with the knowledge that he got off the island but he didn’t know if the other prisoners he left behind had. He said the Japanese told the prisoners if any escaped, 10 others would be killed because of their escape. Ellen Caron said it was unheard of that a soldier would have someone to talk to at that time. She said her father-in-law was clearly still affected by his experiences. He will talk about his experiences to his family only. Darrell’s father doesn’t usually talk about them at all. Major Michael Backus of the Maine Army National Guard said the military approaches the mental health of its soldiers in a completely different way now than in those two previous wars. He said before there was no help for soldiers, who were expected to deal with their problems internally. In the field, soldiers now receive individual counseling from counselors like Darrell Caron. Caron said he works with soldiers who are experiencing troubles but also with soldiers who aren’t experiencing mental health issues, as a preventative measure. When a soldier returns, he or she is required to go through a one-on-one assessment with a counselor to determine the soldier’s mental state following their time in action, according to Backus. Backus compared the military’s change in attitude towards mental health to the change in the opinion of society at large since the World War II and Vietnam. He said the military is constantly evolving its care in an attempt to do everything it can for soldiers and veterans of wars. According to Jim Doherty, staff assistant at the Togus Veterans Affairs Medical Center in Augusta, things began to change after Vietnam. In 1980, the VA set up its first veterans’ centers, which operate as small counseling centers for veterans. Doherty said the VA now has five vet centers in Maine, each with usually about four full-time counselors who provide counseling to veterans and their families on military-related issues at no cost. There are over 200 vet centers across the U.S.
Doherty said the VA has begun an outreach program since the U.S. military began its war on terrorism following Sept. 11, 2001. The outreach program consists of VA representatives meeting with soldiers after they come back from the war and educating them about the mental health resources available to them. In addition to the five vet centers, the VA also has two mental health clinics in Maine. “The services we have now are wide-reaching and comprehensive,” said Doherty. Unlike his father and grandfather, Darrell Caron will have resources available to him when he gets back from Iraq. Ellen Caron said she’s worried about her son because she has seen the effects of war on her husband and father-in-law. She said the two men have carried the effects of the war through their entire lives. She said her husband just in the last few years has had nightmares and anger and depression because he never dealt with his problems. She said the sound of a helicopter still bothers him, 40 years later. Darrell Caron said he feels as though his transition back into life after war will be easier than his father’s and his grandfather’s, partly due to his being older than they were and partly because of the way the military and society put more emphasis on mental health these days. He said he’s unsure if he’ll stay in the military after he gets back. He said he’ll probably take about three months to think about it. If there was a way for him to stay in the military without going back to Iraq, he said he would. Of course, there’s no guarantee. In that case, he said he wouldn’t choose to come back. As far as talking to people about his experiences, he said he plans on getting counseling when he gets back so he can deal with any problems he has. He said he wouldn’t be comfortable talking to other people. But there were two people he thought he’d talk to. “I think the first people I’ll talk with will be my father and my grandfather,” he said. Darrell Caron at Camp Caldwell training base 90 kilometers northeast of Baghdad and close to the Iranian border in Iraq. 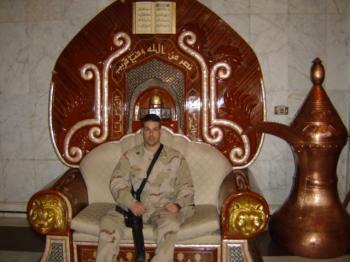 Darrell Caron takes a short break to sit in one of Saddam Hussein’s former palaces in Iraq. 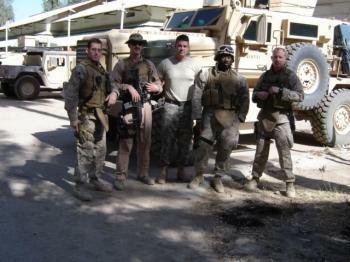 Darrell Caron stands with several Marines serving in an explosive ordnance disposal effort.